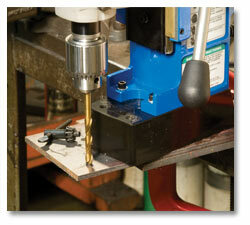 Two sizes of Drill Chucks are available for Hougen Magnetic Drills. 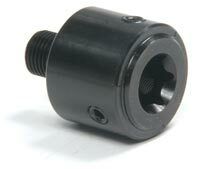 The 1/2" Chuck fits Models HMD904, HMD905, HMD917, HMD914. The 5/8" Chuck fits the HMD917 & HMD914. 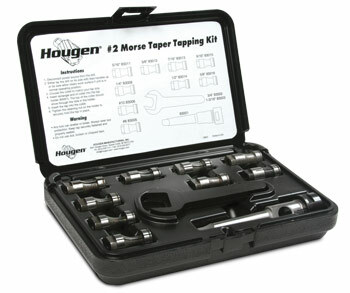 Quickly tap holes from #8 to 5/8" with the #2 Morse Taper Tapping Kit. Includes collets, holder and wrenches. Made in USA. 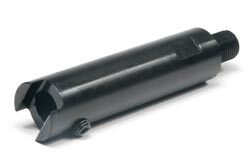 Lightweight, easy to install design incorporates a planetary gear reverse with a 1:1 ratio. Reversing speed is equal to spindle speed so in-feed and out-feed of the unit can be employed without reversing motor direction. 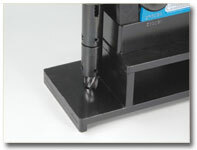 Tapping Kits are not recommended for use with swivel base drills. Designed for use with Hougen Magnetic Drills, 82° Countersink is double fluted with carbide inserts for maximum cutting action and long life. 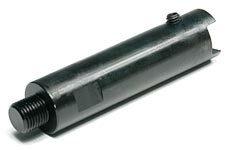 For holes from 9/16" to 15/16" diameters. 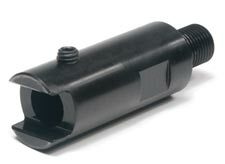 #2 Morse Taper Adapter easily fits on the HMD917 to accept morse taper shank twist drills or reamers. 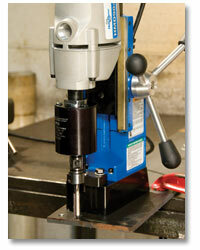 Will work with up to 7/8" dia twist drills or reamers with a max length of 10.25". 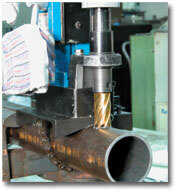 This Pressurized Coolant System is used for drilling when gravity feed coolant is not applicable. 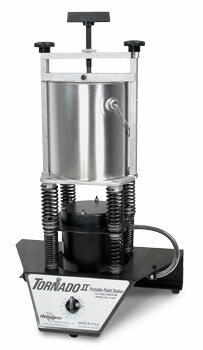 With the coolant bottle removed, the pressurized system easily attaches in its place. System's bottle holds two gallons of coolant. 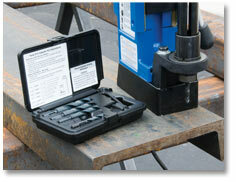 These kits let you drill pipe and tubing with a minimum 3" diameter and some convex surfaces. 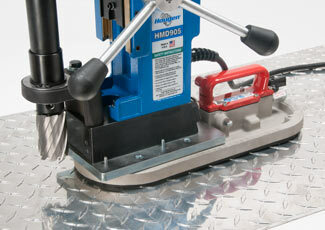 Kits quickly attach to your Hougen Magnetic Drill and positive non-slip positioning assures centered hole location. 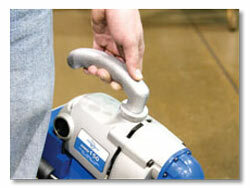 Convenient & ergonomic handle helps to carry and/or move your drill around. Fits HMD115 & HMD150. With the feed handles of Hougen Models HMD505, HMD904, HMD905 removed the Ratchet Drive is easily installed allowing use of a standard ratchet handle for drilling in confined areas. Ratchet Drive operates from either side of the drill. 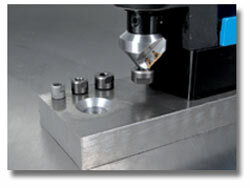 With the RotaLoc Spindle Adapter you can take advantage of the fast changeout of RotaLoc or RotaLoc Plus Cutters. 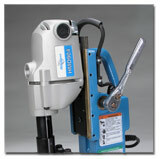 Works in all Hougen Portable Magnetic Drills or any other drill that accepts Rotabroach "12,000-Series" Cutters. 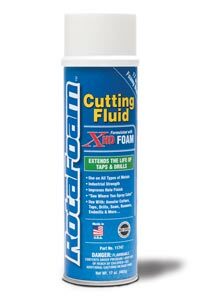 RotaGel Cutting Lube is an extremely environmentally friendly lubricant for all types of metals and metal working applications. 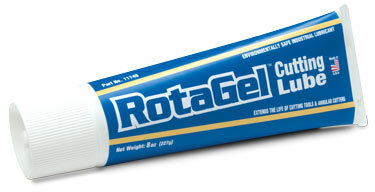 The blue colored gel assures thorough coverage and provides long lasting superior lubrication. 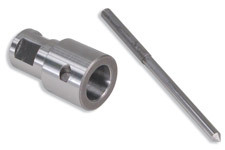 Use with annular cutters, taps, drills, reamers, end mills, & more. 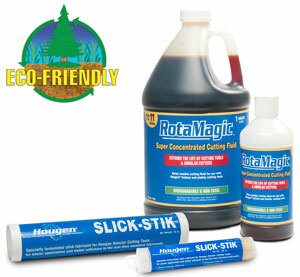 Biodegradeable & Non-Toxic. (1) 55 Gallon Drum, makes a lot of coolant! 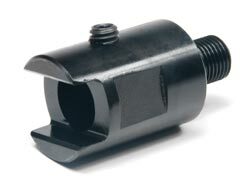 When extended reach is necessary, Hougen offers 1" and 2" Arbor Extenders with a 1.310" dia. that fit arbors using "12,000-Series" Cutters. 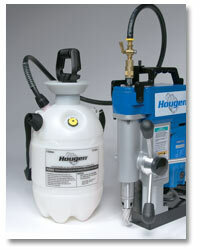 Hougen Manufacturing maintains a complete stock of replacement parts for all models of Hougen Magnetic Drills. Our computerized order system means your required parts are often processed and shipped the same day that the order is received. Visit our technical service page for more information.